Featuring the coat of arms of Felix V (1440-1449), who belonged to the House of Savoy and was elected Antipope by the Council of Basel, a minting die constitutes part of the collection of dies for coins and medals of the former Basel Mint which, for reasons of conservation, was transferred to the State Archive in 1905. 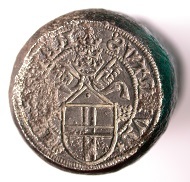 The minting die is an important testimony to this Basel Council Pope struggling for legitimacy. 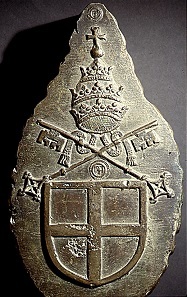 Surface of the top die for the gold gulden of (Anti)Pope Felix V, Basel Historical Museum (HMB) inv. 1905.3596. Slightly corroded, unfortunately, the die bears the legend FELIX*P[a]P[a]* – *QVINTVS and, in an interrupted dotted border, displays the cross shield of the House of Savoy under crossed keys and a tiara (HMB inv. 1905.3596). So far, no matching bottom die has been identified. Already Ernst Alfred Stückelberg, when the piece was published the first time in the 1908 issue of the Rivista Italiana di Numismatica, realized that it once served as a tool in the Basel Mint for the production of gold gulden. From the looks of it, it was used in the practical process indeed, as indicated by the marks and the bulge at the top of the die. However, as yet not a single specimen coined from this die has been found – and, in all likelihood, it never will be. 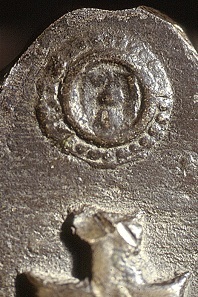 Top and side view of the minting die for the gold gulden of (Anti)Pope Felix V, HMB inv. 1905.3596. After the break with Pope Eugene IV (1431-1447) and his removal, Felix V was elected on November 5, 1439, by the Council of Basel, which took place in 1431 for the first time. The Duke of Savoy, Amadeus VIII (Duke 1416-1434), who had abdicated in the meantime, was elected not only for his piety but for his wealth and influence, in the hope that this might help establishing the Council’s position in the controversy with the pope in Rome. He was unsuccessful, however, and Pope Eugene IV soon gained the upper hand on both Antipope and Council. 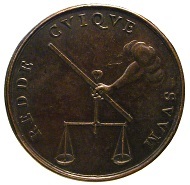 Restitutional medal by Girolamo Paladino on Pope Eugene IV (1431-1447), the reverse featuring the scales of justice and the motto REDDE CVIQUE SVVM (“to each his own!”), HMB inv. 2016.6. It goes without saying that Felix V was considered legitimate pope in Basel where his elevation was celebrated solemnly on the Münsterplatz (cathedral square) and in the Münster (cathedral). Enea Silvio Piccolomini, humanist and later to become Pope Pius II (1458-1464), was secretary of a cardinal at the Council of Basel first, envoy of the Council later, and he even rose to the position of secretary of the antipope. Therefore, he could give a thorough account of the ordination and the coronation of Felix V taking place on July 24, 1440. Not only is his account remarkably detailed, but the acts he describes perfectly correspond to the usual papal ordinations performed in Rome. That should have promoted the legitimacy of the new pope who, however, had been elected and ordained at the wrong place. 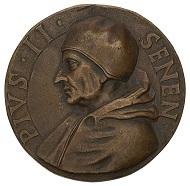 Medal on Pope Pius II, the former Council participant and envoy Enea Silvio Piccolomini, who bestowed a privilege for and granted the foundation of the University of Basel in 1460, HMB inv. 1905.678. The newly elected German King, the Habsburg Frederick III (1440-1493) as well as his predecessor and the electors remaining neutral in the conflict between Eugene IV and the Council, only Imperial Archchamberlain Conrad of Weinsberg (1370-1448), in his capacity as Protector of the Council, and the margrave of Baden-Hachberg-Rötteln performed the honorary service, the so-called strator service, for the pope. 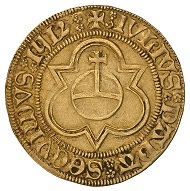 Conrad of Weinsberg also owned the right of lien of the Imperial Mint of Basel for the issuing of gold gulden. The morning following the coronation, after the morning service, Felix V gave a number of prelates “two silver coins and a gold coin” (duo argentei nummi et unus aureus). 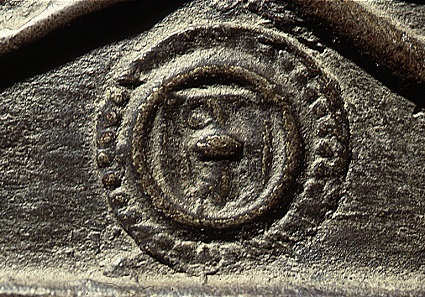 It can be assumed that this phrase refers to the coins that were minted in Basel, which is further corroborated by the depiction of the then circulating pfennige produced by the civic mint, a rappen and half a rappen called a stäbler, flanking the papal coat of arms on a bell that was cast in honor of the new pope. Fragment of a bell in honor of Pope Felix V, featuring the papal coat of arms and the impressions of a Basel rappen and a stäbler, with the Baselstab (crozier) shield in a linear border and a dotted border, in accordance with the 1425 Treaty, HMB inv. 1873.55. 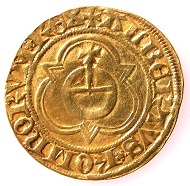 It is safe to assume, therefore, that the distributed aurei refers to gold gulden minted in the Imperial Mint of Basel, particularly as the owner of the mint, Conrad of Weinsberg, served as Royal Deputy and Secular Protector of the Council. As the second universal ruler next to the emperor, the pope was also entitled to issue an honorary coinage in his name, similar to the royal court strikings that were common in the Middles Ages. A top die was made, bearing the papal coat of arms. 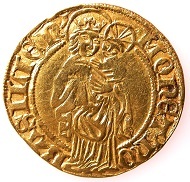 The reverse is likely to have been a bottom die featuring the patron saint of Basel, Virgin Mary, Mother of God, as it was used for the later coin issued in the name of King Albert II (1438-1439) and the early gold gulden of Frederick III. Gold gulden of the Imperial Mint of Basel, in the name of King Albert II of Habsburg (1438-1439), HMB inv. 1903.2535. More than seventy years later, in 1512, the then pope once again expressed his universal claim on the regalia by granting the citizens of Basel, as participants in the victorious campaign of the Confederates against Louis XII King of France (1498-1515), the right to mint their own gold coins. Already in the same year, civic gold gulden in the name of Pope Julius II (1503-1513) were minted in Basel. Just to be on the safe side, the city, however, also approached the emperor for a gold coin privilege, which was actually granted in 1516. 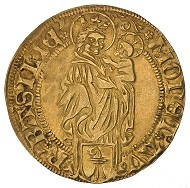 Gold gulden 1512 of the city of Basel, in the name of Pope Julius II (1503-1513), HMB inv. 1905.2508. 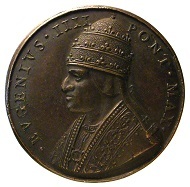 In the light of the fact that the Savoy Council Pope Felix V was unable to prevail, it is not surprising that there are no specimens of this rare ceremonial coinage extant anymore. The few prelates who were given these aurei in July 1440 most likely have hastened to exchange their gold gulden for other coins when it became obvious that they had taken part in the coronation of a pope that was ultimately defeated, hence the schismatic and “wrong” pope. 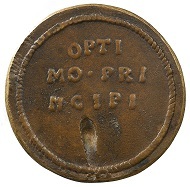 What modern collectors would consider a coveted rarity, to their owners, in contrast, such coins, only a few years after their issuing date, were a dangerous ecclesio-political corpus delicti. This is the website of the Basel Museum of History. They just opened an exhibition about Padua and the pull of the Ancients. More about it you will find here. Of course, CoinsWeekly has reported about it. 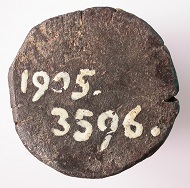 Here we can offer to you an insight into the coin collection of the Basel Museum of History. Unfortunately a lot of information about the history of the Coin Collection is available only in German. But you should be aware that the collections of the Basel Museum of History date back to Erasmus von Rotterdam (1466-1536) and Basilius Amerbach (1533-1591).